The goal of the study was to determine whether veterans would accept novel methods for Barrett’s esophagus screening and if they did which method would be more acceptable. Current methods for detecting Barrett’s esophagus are woefully inadequate. New, less expensive methods for screening need to be developed. Figure 1. 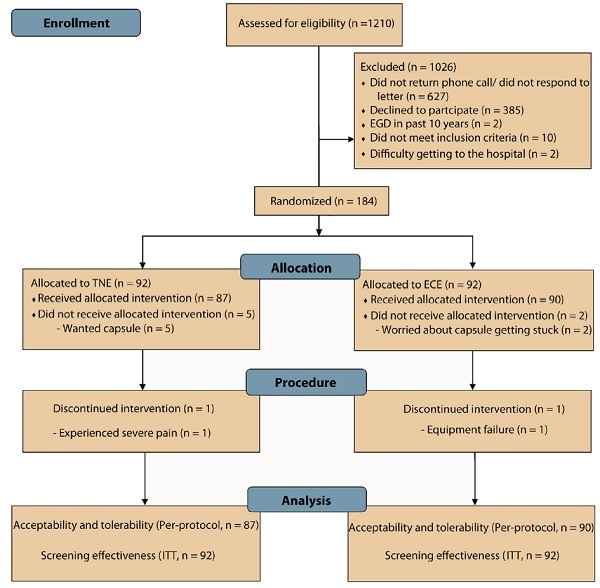 Flow chart of patient randomization to transnasal esophagoscopy and esophageal capsule esophagoscopy. TNE, transnasal esophagoscopy; ECE, esophageal capsule esophagoscopy; ITT, intention-to-treat. Our major finding, which in retrospect might not be a surprise is that only a small subset of people we approached, less than 20%, were willing to undergo screening for Barrett’s esophagus. We were also expecting that patients who agreed to screening would be much more likely to accept esophageal capsule than transnasal endoscopy. However, we found that if a patient was interested in screening the patient was willing to accept transnasal endoscopy nearly as much as capsule. So the major barrier to detecting Barrett’s esophagus seems to be a willingness to undergo screening and not what type of test is performed. Read the abstract for this article online here.